Barrier Group Pty Ltd presents the Menni-Q, a modular pedestrian separation fence system designed for use indoors and outdoors. 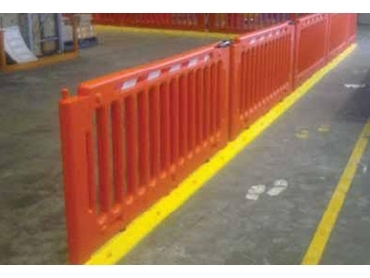 Providing a high degree of design flexibility, Menni-Q pedestrian separation fence systems are moulded from LLDPE with solid colour. The impact-absorbing, non-conductive, corrosion- and-abrasion resistant fence system is extremely durable and highly visible, and will not fade, rot, rust or crack, making it almost completely maintenance-free. Weight: Panels and Menni 10kg/metre approx.